The American Bankers Association (ABA) has written a letter to the Consumer Financial Protection Bureau (CFPB) in response to the new consumer complaint database announced last month, according to the CFPB Monitor. The consumer complaint database allows consumers to make their complaints public while giving the company a chance at a structured response. 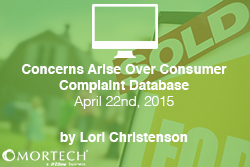 The current Consumer Complaint Database used by the CFPB since June 2012, only gives information about the type of product and the action the company took to help. With the new database, the consumer is able to tell the story in their own words with only personal information removed. Companies are given the choice to choose from a list of structured public responses but are under no obligation to do so, according to the CFPB. Add a field that indicates if the consumer has opted in to publication of the complaint. Provide a more conspicuous disclaimer to protect against consumer misinformation. Allow banks to identify and block complaints regarding matters out of the banks control. Normalize and provide context for the data. According to the letter from the ABA, the deficiencies with the database may lead to “publication of unverified and potentially misleading consumer narratives.” Also, a company’s reputation may be damaged by the limited available responses they are allowed to answer with.